I have recently been parking my car on a side street near work as there aren't any spaces in the office car park. The street in question is St Peters Way, near Timothy's Bridge Road, Stratford Upon Avon. There are quite a few offices in the area and parking is often very limited. Although there is a Park and Ride not too far away, there are also a fair number of side roads with no obvious parking restrictions. I arrived back at my car yesterday after work to find a sheet of A4 paper folded underneath my windscreen wiper and upon opening it up found a rather snotty letter written by one of the residents. I also noticed the same letter posted on the windscreens of several other cars parked nearby. I found the general tone of the letter quite intimidating and in the last paragraph they even threatened to report anyone who continued to park in the street to their employer who would then take disciplinary action (which they had apparently agreed with the residents they would do in such cases). I can't actually see a good reason why these residents (or this one) would object people parking where they do other than them simply being territorial and perhaps a bit snobbish. My car (and the others) were not parked outside someone's house, they were parked on the opposite side of the road. All these houses have their own courtyards with parking anyway and no one was being inconvenienced or blocked in. There are no road markings or double yellow lines. and there are no signs prohibiting parking or limiting it to residents only. There is no reason at all why someone can't legally park on this side road and the feeble excuse about 'access for emergency vehicles' is just that, because there is plenty of room on the road. Perhaps it's because I drive a scruffy old VW Polo and it's lowering the house prices in the area - who knows! Why do some people have to behave this way? I could understand if the cars were parked outside a house or blocking someone in, but to react in this way is just petty. I found the letter quite distasteful would have thought that a polite request would be a much better approach. Resorting to threatening people is pretty low really and I suspect the person who wrote the letter may be nothing more than a busy-body who likes to wield a bit of power and has nothing better to do with their day. For now though I'll park somewhere else because these small minded people are just the type to take the law into their own hands and start causing damage to vehicles parked on what they see as their own personal territory. They're still at it in 2017 bless 'em their threats to tell my employer are empty since I work for myself and vandalism will only result in every resdient of that street paying higher insurance premiums.. I don't park near driveways/junctions or outside anyones front door so this is just a bunch of self entitled twats who think they own the street I would never do it to anyone who parks outside my house I'd just drive further down and use my legs to get me back home. As a resident of St Peters Way I must beg to differ. Unfortunately some of the people who elect to park here during office hours lack basis common sense. They park on both sides of the road, including 90 degree bend, resulting in anything larger than a family car being able to squeeze through. I am becoming increasing fed up of suppliers informing me that they no longer deliver to St Peters Way due to lack of access for their vehicles. I was attending a conference in London on 25th July 2014 and commuted from Harlington, near Dunstable in Bedfordshire. PLEASE PARK WITH CONSIDERATION FOR OTHERS AND DO NOT CREATE A TRAFFIC HAZARD. THIS JUNCTION HAS CONSIDERABLE AMOUNTS OF TRAFFIC THROUGHOUT THE DAY INCLUDING HEAVY GOOD VEHICLES. ELDERLY PERSONS AND YOUNG CHILDREN CROSS THE ROAD HERE TO GO TO THE SHOPS. NOBODY WANTS MORE YELLOW LINES AND PARKING RESTRICTIONS BUT INCONSIDERATE PARKING BY COMMUTERS MAY, EVENTUALLY, RESULT IN SUCH RESTRICTIONS BEING INTRODUCED. You MUST NOT leave your vehicle in a dangerous position or where it causes any unnecessary obstruction of the road. DO NOT stop or park opposite or within 10 meters of a junction, except in an authorised parking space. Other cars were parked on top of the junction nearer than I was - but I suppose they were locals. The pieces above from The Highway Code and Road Traffic Act are there for opportunists to treat those they wish to reject as being in the wrong. In this case it is just an opportunity for the locals to have a go at outsiders parking their cars on their roads. They seem to have it in for commuters and label us as “inconsiderate”. 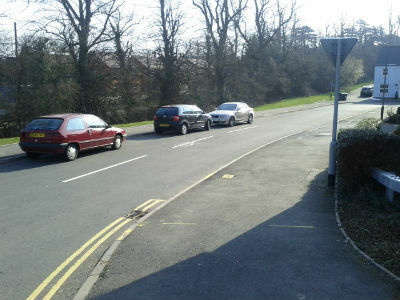 I have paid my Vehicle Excise Duty which means I can park anywhere which is safe – and where I parked on a straight stretch was safer than some of the other cars parked on the bend. You know . I can't help noticing that most drivers think any empty space is fair game ,, were ever they see one , they just have to park there . What's lowering the house prices in the area might well be a scruffy VW Polo, but more likely to be the fact that the residents of this area are well nigh brain dead. Who would care or damn well want to live in this area where you purport to live? I have seen this from both sides, having once used back street parking to avoid hefty station car park charges. Got a snotty comment from a resident, but there was literally nowhere else to park (near station in Loughton, Essex). At the time I lived with my parents deep in the forest in a park home and I just had to take the car to commute. Nowadays I live in a private estate (3 housing associations, shared ownership). Opposite is one house (2 flats, neither car owners), and the church. Few houses down to the right, then another larger estate, and our allotments where there is parking for about 6 cars. A few years ago the council put down yellow lines in the main road as two way traffic was getting gridlocked due to the church goers parking everywhere. Now, they park on and in our estate, on the tiny stretch of road between our dropped down kerbs and the entrance to the estate - so causing an obstruction, down the road, and anywhere they can find! There is also a school in the main road, and the staff use our road too. We have constant compost deliveries to the allotments and there have been times when the lorry has simply not been able to get through. Vans, lorries and other larger vehicles always have problems negotiating the road when parking is heavy. I would LOVE it if the council were to paint yellow lines down our road, in particular my side, where they obstruct our entrance. I often wonder what would happen if a fire engine were needed. They just wouldn't make it in, with the tightness of cars, and 2 way traffic is impossible. Early next week my neighbour and I will be meeting the Minister, and the parking issue is one we will be addressing. "Britain used to be such a nice place to live. What happened?" Too many of you voted Labour, who destroyed the social fabric and innate decency of the population, then allowed unlimited immigration and loony leftism to rule. Hi, I have the opposite problem. I rent a house and people park in front of it, actually on the drive, which is private property. Plus, the rent I pay to the landlord includes a bit for the parking space. So, when I get back at night, I end up having to park down the street and walking because someone has parked in my spot. If it was on the road in front, I wouldn't mind but this is on private property. I also get men in white vans parking there, sitting eating their lunch and then staring at me as I walk into the house! I'm popping back for lunch and leaving my car round the corner and THEY are glaring at me! And yes, I've tried knocking on the van window and explaining the situation and the response is either patronising "All right love, don't get your knickers in a twist. I'm moving in a minute - just finishing my flask of coffee." or abusive - I can f--ing well park where I LIKE!" Britain used to be such a nice place to live. What happened? Sounds like it is probably one resident that is creating the fuss. I work for the police and the amount of calls we receive regarding legitimate parking that is seen as a nuisance is unbelievable. Some people even use 999 to report it, honestly. I imagine that eventually enough pressure will be put on the council and Neighbourhood Policing Team by this individual and parking will eventually be made an offence there. It will probably take 2 or 3 years however the amount of money spent to deal with it will be astronomical. And we all wonder what we do with public money. I agree there is no sense, but it's the planning authorities who impose this regulation, the idea is to 'encourage' people to use public transport, bikes, skateboards, etc. Likewise all newly built hospitals (around London anyway) are deliberately allowed less parking, both staff, visitors and patients, that is actually required, again by the planning authority. The result is staff parking in surrounding roads or enterprising locals renting out their front drive. In both cases it's one of those ideas that sounds great in a committee meeting, but less fun when a young doctor or nurse finishes their shift at 10:15pm in December and has to walk a mile to the car as the public transport finishes at 10:00pm. All seems a bit petty to me! The only concern I would have if I were in your position would be the possibility of vandalism. As regards your employer getting involved, that's total nonsense. There is nothing they can do. Just for the record, and to correct those thinking that you can park wherever you like (provided no restrictions are in place), it is actually an offence to leave a vehicle parked unattended on a road! Bizarre but true! Of course, with the amount of vehicles on the road today it is hardly enforceable any more. I cannot understand the lack of parking in the UK now. Even on new developments the construction company only provide sufficient parking for one car per house. Where is the sense in that? I know this is brought about by the company wanting to build as many houses on a patch of land as possible to maximise profit but I think it is time that they are made to provide adequate off road parking to prevent issues like this. Our company recently moved offices to a new build complex. There are 56 people in the offices yet only 14 parking spaces!!!! Apparently this is intentional. It is supposed to make people think green. Public transport and car sharing is being actively encouraged by local authorities at the expense of those to whom it is not a viable option. Sounds like this person is trying it on. Either eay leaving. Letter onyour windscreen in this manner is harrassment and should be reported. Unless there are parking restrictions or it is a private road, you can park anywhere. But, if there are 'dropped kerbs', you should not park across those, in theory it's obstructing access. I am interested as to how they would know your employer? Assuming they do have the agreement with the employers in the area, I find it odd that your employer (or any others) have not circulated a note to that effect at work? The phrase 'trying it on' springs to mind.